So recently I’ve hit this problem twice and while I’ve solved it to a satisfactory degree, I can’t help but feel there might be a more elegant solution. In this post I’m going to outline the problem as well as my solution with the intention of either starting a discussion or perhaps helping someone else who is facing the same problem. Now obviously this is an error minimization problem but the trick is to represent the error in orientation and position in a way that we don’t bias the overall error in favor of one or the other (i.e. both orientation and position are equally important). In lay mans terms, we need to reduce the error of the orientation and position to the same range. So let’s start with treating the two components of the transform individually. Orientation is simple enough, we define a “forward” axis for our transform and using the reference transform as a starting point, we calculate the angle needed for the shortest rotation between the reference transform’s forward axis and the target transform’s forward axis. Since we are looking for the shortest rotation, these deltas are in the range or [-180, 180] which allows us to calculate an error metric for the orientation to be the absolute value of the delta angle divided by 180 degrees which results in a 0-1 error metric where 0.0 is a perfectly matching orientation and 1.0 is the worst possible error. Position is the problem, it’s easy enough to calculate the distance between the reference and each target but those distances cant be easily compared to the orientation error since they are not in a 0-1 range. And this is where I starting feeling like what I did was slightly in-elegant. So solve the problem, I did the dumbest thing I could think of. I simple calculated the max distance between any of the target transforms and the reference transform. I then used this as my error scale and for each target transform, divided it’s distance to the reference transform by the worst possible error. This reduces the position error to a [0,1] range where 0.0 is a perfectly matching position and 1.0 is as for the orientation case the worst case scenario. Since I now have two 0-1 error values, it is relatively trivial to find the best target transform relative to the reference transform, it also easily allows me to bias towards orientation or position by applying a 0-1 bias weight, where 0 is only using orientation and 1.0 is only taking position into account. This seems to solve the problem well enough for me but I’m curious if there isn’t a different/better solution. Something just feels off for me with my approach. This post is a quick brain dump on the topic of animation root motion and how to blend it. There doesn’t seem to be a lot of information on the topic online and so I think it’s worth doing a fast post on it. Before we carry-on, lets quickly discuss what root motion is. Root motion is a description of the overall character displacement in the world for a given animation. This is often authored as a separate bone in the DCC (max/maya/MB) and the animation is exported to the game-engine with this bone as the root of the animation hierarchy (at least conceptually). This information can then be used by animation-driven systems to actually move the game character in the world. Weirdly, the topic of root motion is not one I can find a lot of information on and I guess this is probably since most games tend not be be root motion driven as it is often easier to get the desired reactivity of characters with gameplay driven approaches (trading the physicality of movement for reactivity to inputs). To determine the motion of a character each frame, we calculate the range on the animation time line that this frame update covered and return a delta value between position of the root bone at the start and at the end of the time covered on the animation timeline. This delta transform is then applied to the current world transform of the character we are animating. Now lets quickly touch on animation blending, which is pretty much at the core of all current-gen animation systems. No matter what sort of fancy logic we have at the highest level (HFSM, parametric blendspace, etc. ), we almost always end up blending some animation X with some animation Y to produce some pose for our characters. In general, when we blend animation poses we tend to blend the rotation, translation and scale of each bone separately: the rotations are spherically interpolated (SLERP) while the translation and scale are linearly interpolated (LERP). This linear interpolation for translation makes sense since the translations for a bone describe the length of that bone. In the above image, we are interpolating between two vector that have the same length but different directions. The yellow vector represent the linear interpolation between these two vectors. As you can see when we are 50% in between the two vectors, the resulting vector has a length that is half that of the original vectors. If these vectors represented the movement of a character e.g. strafing fwd+right, we would end up moving half as slow as we would if we only moved in a single direction. This is obviously not what we wanted and in-fact will cause some nasty foot sliding with the resulting animation. Scale the interpolated heading direction to the interpolated length calculated in the first step. The result of this operation is shown by the cyan vector in the above example. As you can see the length of the vector is now correct. Unfortunately in terms of heading, we still have an issue. Lets look at another example below where there vectors have different lengths as well as different directions. Now obviously as you can tell this is a very expensive way to interpolate two vectors, but it does give the best results, as visualized by the purple vector in the examples above. Now the problems with the motion blending I described are worst the larger the angle between the two vectors is (see the example below). Here you can clearly see the NLERP result initially lagging behind and then overtaking the SLERP result. I had spent the better part of a year and a half thinking about and researching what I would have want a next-gen AI framework to be. 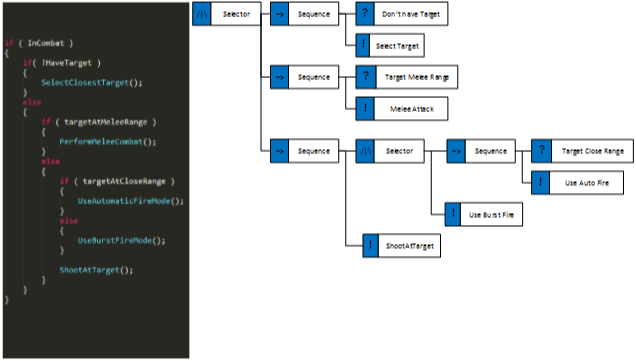 This framework was intended to live within the engine layer and provide a generalized architecture for writing and executing any kind of game AI. I think the best description of the intentions was that I was trying to build a “genre and game agnostic” AI system. My primary concerns with the framework’s design were ones of production. I don’t believe AI can continue to exist only in code and we need to embrace more data driven approaches in terms of authoring AI. 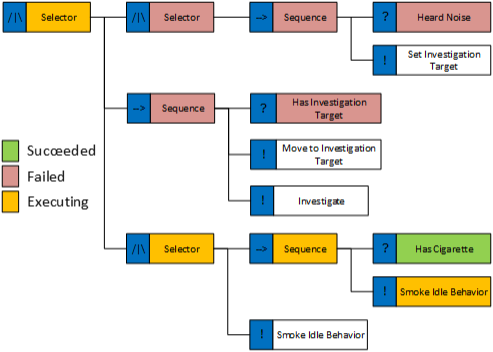 In any case, this viewpoint is not shared by the vast majority of my peers which often makes discussions about this topic quite difficult but as part of this generalized framework research, I did a fair amount of work on behavior trees (BT). I went through numerous iterations on the core BT architecture. As part of this work, I came to some conclusion for overall decision making and behavior authoring. For the most part, this work was abandoned and I’ve now resigned myself to the fact that I will probably not get a chance to move forward with it. I feel the information is still useful and so I would like to share my ideas and conclusions in hope that it might trigger a discussion or inspire someone to do something awesome and crazy. This information sharing will be split into two articles, the first discussion about my final BT architecture and and the second will delve into my conclusion and why I feel that way. NOTE: It is also extremely important to make it clear that that what I am about to discuss is not new techniques or ideas but rather an attempt to formalize some concepts and architectures of behavior trees. This information is necessary for the follow up article. Traditionally, behavior tree evaluation starts at the root, and proceeds, depth first, down the tree until it reaches a successful node. If an environmental change occurs that the affects the tree, it will be detected on the next evaluation and the behavior changed accordingly. This implies that you need to be careful when authoring the tree to ensure higher priority behaviors are placed before lower priority behaviors so that we get the proper “reactivity”. One thing that initially bothered me when looking at various behavior tree implementations was that whereas I saw then as tool to author actual behaviors, a lot of programmers saw BTs as a way to describe the transitions between behaviors. What I mean by is that the granularity of actions in their trees was quite low. You would see leaf nodes such as “FightFromCover”, “GoToCover” or even worse stuff like “RangedCombat” and “InvestigateSuspiciousNoises”. That’s not to say its always the case, I have seen examples of BT with a much higher granularity in their nodes such as “moveto”, “shoot”, “reload”, “enter cover”, etc… This, at least for me, seemed like a more attractive alternative as it allows designers to actually prototype and author new behaviors without depending on a programmer to build the behavior. I envisioned a workflow when game designers could to a large degree script with BTs. The reality is that a lot of newer designers in the industry are not able to script using code and since I don’t want to artificially lock them out, I wanted to provide a toolset for them to be able to have some degree of autonomy with their prototyping and designs. There is one downside to increasing the granularity: massive growth of the tree size and this can have a pretty bad effect of the performance profile of a tree evaluation especially when in the lowest priority behaviors. Given the simple tree below, to reach our currently running behavior, we needed to evaluate numerous nodes earlier in the graph. 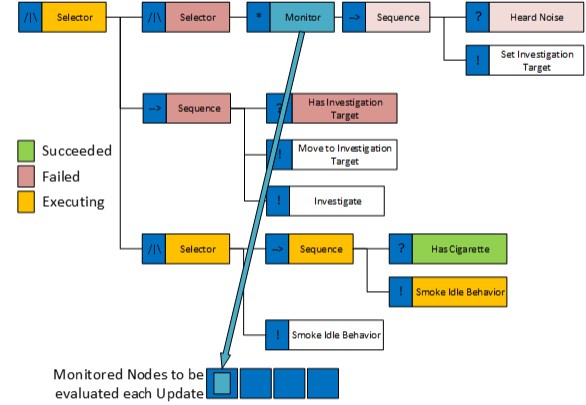 For each subsequent update of the behavior we still need to traverse the entire tree, checking whether anything has changed and whether we need to switch behavior. With massive trees, the cost of this traversal can quickly add up. This cost is especially depending on the cost of your condition checks as they will make up the bulk of the operations performed. I hope the irony that the most expensive BT update occurs when the agent is doing nothing, is not lost on you. RANT: To be frank, I find a lot of performance discussions regarding BT’s to be misleading. I would love to be in a situation where the most expensive thing in my AI update was the actual tree traversal and not the work being done by the nodes. The condition nodes alone, will almost certainly incur cache misses when querying your knowledge structure (be it a blackboard or whatever) as will any calls into other game systems. Barring some sort of idiotic implementation, I think that your time optimizing a BT is better spent in minimizing the cost of the work being done by the nodes and not the traversal of said nodes. Naively, my first thought to get around this problem was that I didn’t need to re-evaluate the entire tree each time. I could simply just resume evaluation at my last point. 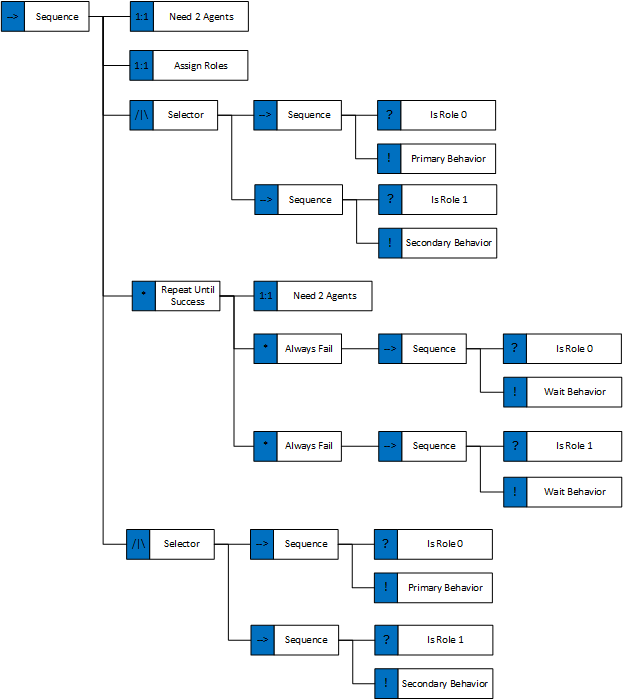 This is similar toward AIGameDev’s “Event driven behavior trees” but there are some problems with this approach, some that are not covered in the AIGameDev (http://www.youtube.com/watch?v=n4aREFb3SsU) materials. The main problem is that you lose the reactivity of the tree, what I mean by that is that you will only ever react to new events only once the tree finishes an evaluation i.e. a behavior fully completes. It’s also unclear what happens in the case of parallel nodes, as we could at any given point be running N behaviors in parallel across multiple branches of the tree. After some thought, I decided that there was no way around repeating the evaluation from the root each frame without losing basic functionality. Instead, what I decided to do to limit the amount of work done, by storing the state of each node across subsequent evaluations. I would store the state of each node as it was calculated, then on subsequent evaluations, I would skip all the nodes that had previously completed (succeeded or failed). The stored state of the BT nodes would only be reset once the tree fully completes the evaluation. For clarity’s sake I’m gonna refer to these technique as a Stored State BT (SSBT). On the second update, nothing has changed, so we evaluate the tree skipping all nodes that have completed (i.e. succeeded or failed) and we re-enter the smoking behavior and update it. So far so good. On the third update, a noise is detected, but since our evaluation skips completed nodes, we never enter the first sub-branch until the smoke behavior completes and so we will not react to the sound. This is obviously broken. The repeat decorator was moved to after the first selector node and a sequence was added before it. Granted this example is bit contrived but it does highlight a very real problem. As a result of this setup, after the first evaluation the first sequence node’s status is set to “failed” and on the subsequent evaluation the repeat node will not be reached so we are back to the original problem. The solution I found this problem was actually quite simple. I created a new decorator called a “Monitor”. This decorator had an interesting behavior in that when encountering a Monitor decorator, we would evaluate its child node and store the result of that evaluation (just as before) but the monitor would also register itself to a “monitored nodes list”. Due to the depth first nature of the tree, we would only register monitor nodes with a higher priority that our current branch in the tree. On the AI update after we registered the monitor nodes, we would evaluate all registered monitor nodes in the tree before the tree evaluation step. This simple mechanism allows us to maintain the reactivity of the tree but also prevents us from doing a lot of redundant work. The monitor concept is show in the figure below. 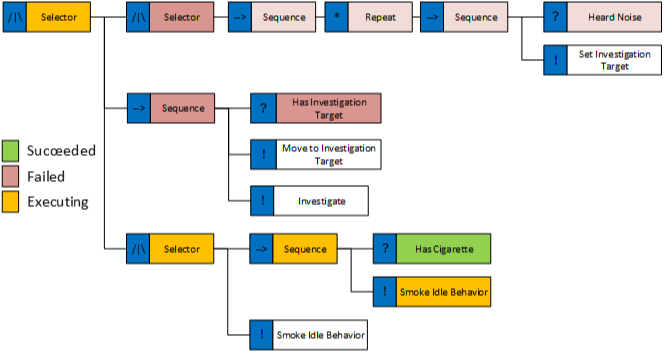 As with any technique, there is a bit of catch, well not a catch but rather that you need to change your way of thinking about the behavior tree. The monitor node concept is powerful but there are some more details concerning the monitor nodes and the SSBT model that need mentioning. Remember I mentioned that we have the concept of resetting the tree? This is something similar to the “OnTerminate” call that Alex shows in his BT video. We reset nodes primarily when the tree has been fully evaluated i.e. all active leaf nodes complete, in that case we call reset on the root node which traverse the tree and reset of all child node that require resetting. There is also the issue of the resulting state of the monitor nodes. Since we evaluate the list of monitored nodes before we evaluate the tree (essentially evaluating them as standalone trees) what do we do with their return state? Well, this is where the reset comes in. If a given monitored node succeeds, it will return an interrupt result which will cause us to reset the tree and restart the evaluation. This allows us to maintain the reactivity of the tree but also gives us the added benefit of clearing the entire state of the tree, more on that in a bit. Since monitor nodes can reset the tree and will always be evaluated, I would strongly suggest that no actual behavior be placed within them. I used the nodes to perform knowledge and world state queries to see if anything had occurred that I needed to react to. I also tended to use generalized cases for the monitor nodes I had i.e. did I hear a new sound of some class, did I see something I need to react to, etc… In my opinion, the monitor decorator tends to give the AI programmer/designer a bit more control over the performance characteristics of the tree than before. It’s also worth getting into a bit more detail with regards to the reset mechanism of the BT. Resetting a node allows us to actually perform some state clean up operations before re-evaluating the tree. I found this concept extremely powerful in that it allowed me to have synchronicity in actions for the nodes. What I mean by that is that, for example, certain action nodes would change the agent’s knowledge i.e. a talk node would set a “isSpeaking” flag, or a movement node would set a “isMoving” flag and so on. This meant that during the reset of the tree, each node could clean up after themselves in a sensible manner i.e. clearing any flags it had set or sending termination commands to the animation layer. All clean-up is localized to the nodes, each node knows exactly how to clean up after itself. 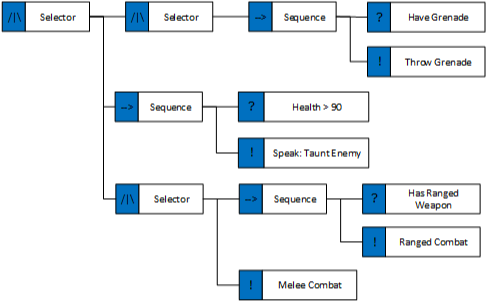 Meaning that you can really have modular nodes that are plug and play within the tree, without having to worry about their potential effects in the context of multiple traversals. Honestly, I think the reset concepts was one of the nicest things about this BT and the resulting implementation code ended up being really simple and elegant. Lastly, the SSBT model has one additional benefit, it actually solves the oscillation problem we mentioned earlier. Since we store the state for a node, once the “move to investigation target” behavior completes, we never have to run it again. Since we track the state, we know that we’ve completed it and can simply let the “investigate” behavior take over. I found this to be quite an elegant solution over the alternative. So now we find ourselves back to the same functional behavior as with the original BT model. In my opinion, I feel that the SSBT model actually has some functional and authoring improvements over the traditional model but hey, I’m biased! As I mentioned earlier, I believe that any performance problems with BTs are a result of the work done by individual nodes rather than due to the traversal of the actual tree structure. I also feel that the stored state evaluation approach really goes a long way to limit the amount of work needed to be performed during each tree evaluation. Note: Maybe some of the keen readers have noticed what the SSBT model has actually resulted in? It wasn’t immediately obvious to me either. When I finally realized it, I was shocked. Don’t get me wrong, it works exactly as intended and I really liked the elegance of the solution and implementation but it led me down a rabbit hole that change my entire perspective of the topic. So let’s actually get to the synchronized part of the post title. One thing I didn’t mention was that, I only starting playing with the evaluation model after I had already done some of the work discussed in this part, it just made more sense for the writeup to discuss it in this order. When I started thinking about the AI framework, my target platforms were both current and next gen. As such memory savings in the order of a few MBs were still really important. Now behavior trees are probably not the most memory intensive things you’ll encounter but I also had the idea of having all of crowd run in the new AI framework. In fact, I wanted to not make any distinction between crowd and NPCs from the AI’s perspective. As such, I was considering having several thousand behavior trees instantiated simultaneously. Let’s say I wanted 5000 characters, and each tree took 3kb, that’s around 15MB of data, there is no way that memory budget would ever be approved on 360/ps3 platform. So decided to share the same tree across all agents. This approach has already been touched upon with Alex’s data oriented trees. My approach was pretty simple, each BT node would have a method called “GetMemoryRequirements” that would return the memory size needed to store its require instance state data, as well as all the memory needed for the node instance data of its children. I would then, for a given tree, calculate the required space needed to store all of the node’s instance data for an agent by calling “GetMemoryRequirements” on the root. I also made the choice then to tightly pack the memory needed into one big block, then I would store each node’s index into the memory block and use that to retrieve the relevant instance data for a node during traversal. During tree evaluation, I would pass in the agent’s node instance data for the specific tree and then each node would index into the memory and pull its state data as required. As it turned out, I didn’t need a lot of data per node, I think my heaviest node was around 16bytes, with the vast majority weighing in at around 4bytes. Now this in itself is nothing special but only having a single instance of the tree which all agent were evaluation gave me an idea. Now it is also worth mentioning that the approach I took with designing the BT was quite animation inspired and so I made use of child trees quite extensively. A child tree is simply a behavior tree that is injected into another tree at runtime. All of our tree were statically allocated so by injected, I simply mean that we would store a pointer to the child tree in a “child tree connector” BT node. During evaluation, we would retrieve that pointer from each agent’s node instance data and trigger an evaluation of that child tree with the agent’s node instance data for the child tree. We would not actually dynamically compose trees in any way, all BTs had a fixed memory size. The child tree concept also allowed us the ability to have multiple agents running different child trees from within the same parent tree connector node. I relied heavily on this mechanism to inject contextual behaviors originating from the environment. Coming back to the synchronized trees, I will, once again, use a contrived example to discuss the concept. You will notice the use of heavyweight behaviors like “RangedCombat” in the example tree, these are simply examples and I don’t recommend using that level of granularity in your BTs. 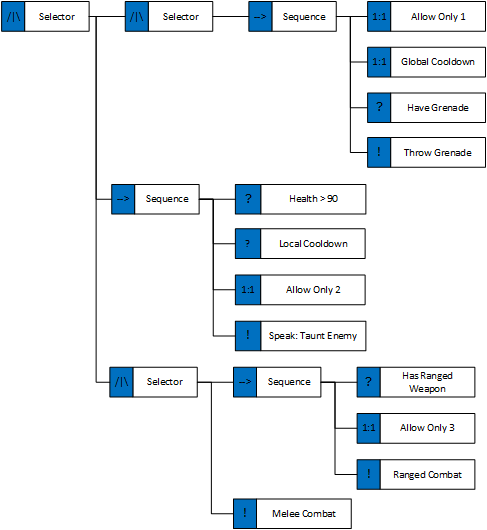 Anyways, so given the very basic combat tree below, we immediately realize that we will encounter some problems when multiple agents run this tree. Can anyone see what they are? We can use what I termed “Gate Nodes” to help with these problems of synchronization. I was inspired by the talk given by the Yager guys at the Vienna AI game conference, and I borrowed the name from them. I’m not sure that their nodes operate in the same manner as mine but I really liked the idea and the name. The basic premise is that with these “gate nodes” you can globally lock down portions of the tree. 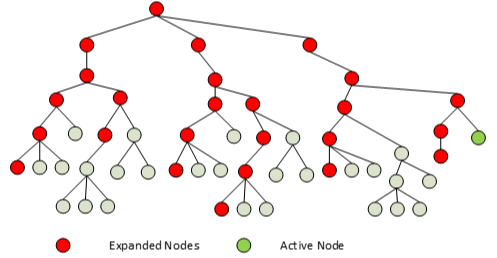 The gate nodes have global state which is stored in the tree as well as potentially having agent specific state. They contain a semaphore which allows us to safely control access to sub-branches in the tree. This means that I can now have “Allow Only X agents” nodes in the tree which means that I can limit behaviors globally to only a certain number of agents. As each agent evaluates a gate node, they will try to take a lock on the node, if they succeed they will enter that branch. For example, if I only want to have a single grenade being thrown at any time or only have 3 guys shooting at me while the rest of the enemies charge me then it is relatively easy to do now. And best of all, this can be done without having to touch any agent knowledge or build any external machinery and its clearly visible in the behavior tree. Furthermore the global state can be used for things like global cool-downs, giving us the flexibility to easily distinguish between local agent cool-down (i.e. special abilities) and global cool-downs (i.e. combat gameplay control by limiting how often grenades are thrown). Best of all, since we only ever have a single instance of each BT, these global locks will also work for all child trees, no matter when and where they are injected, since all child trees are also shared. By using global tree state for synchronization, we can restrict certain behavior branches to only execute when we have exactly 2 agents. We can then assign roles to the agents (for clarity’s sake I’ve left out the conditions for the role assignments). The agents can then perform the first part of their behaviors and once each agent completes they will enter a waiting loop after which we can synchronize their state again. After which they can perform their follow up behaviors. We also have the option to reset the tree for both agent’s if one agent breaks out of the behavior for any reason (i.e. due to an environmental interruption) but I will leave the how as an exercise to the readers in an effort to wrap up this document. 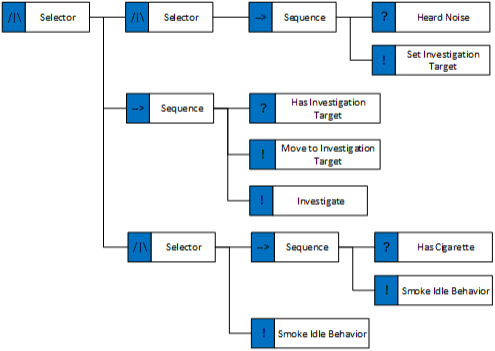 NOTE: One thing that’s necessary to mention is that the above behavior tree would be extremely difficult to construct without using the SSBT evaluation model. In fact, it would be such a pain that that I wouldn’t even recommend trying it. I personally feel that having global tree states is an incredible tool to have when building behaviors. Unfortunately, I have met a lot of opposition to the idea. In fact, when the BT was evaluated by someone else, the very first thing they did was remove the child tree feature and the global tree state. I don’t know, maybe I’m just an idiot and am missing something? I still believe it to be a good idea and this is in part why I feel that I should write this post. If you disagree or spot some obvious problems, please let me know. As a tree that describes a specific behavior i.e. the set of steps need to perform said behavior. Personally I think of BTs in terms of 2, this is where they really shine! I think of a behavior as a visual scripting language and I think its a very elegant productivity solution to use BTs as such and this is context for the material I covered in this article. As for using BTs as a tool for defining a characters overall behavior, I feel that BTs are a sub-optimal solution to the problem and I would never recommend them for that. This is exactly what the topic of my next article will be about. What are the problems associated with trying to build a full character behavior with just a BT, and why using BTs is potentially a bad idea. THANKS: Big thanks to Mika Vehkala for his follow up on this post and our nice long Skype discussion which highlighted some potentially ambiguous portions of the article. DISCLAIMER: I wrote this piece for a South African Game Development Magazine prior to leaving South Africa. It has been some time since I send the piece in for copy-editing and have heard nothing back regarding it so I’m simply going to post it here. The topic is a matter of some debate and the below article is simply my personal opinion! It was mentioned during the initial review by the game development magazine that certain sections of this article are rather inflammatory and we had agreed to remove them from the final piece. Seeing as this is my personal blog I figured I might as well post the entire un-edited version. Once Again this is simply a personal opinion and should be taken as such! When asked to write an article for a local game dev magazine, I was initially apprehensive as writing is not exactly a strong point of mine. It was only once I realized that the article might actually benefit some prospective game programmers that it was well worth the effort. That being said trying to find a topic for the article proved quite challenging. My initial plan was to write a brief article describing the basics of vehicle steering and waypoint following. That idea got scrapped once I built a simple test bed and I realized that I don’t know nearly enough about physics of car motion to write an in-depth article on the topic. So after all these years of hard work, I’ve finally managed to get into the game industry and into a well known AAA studio to boot. 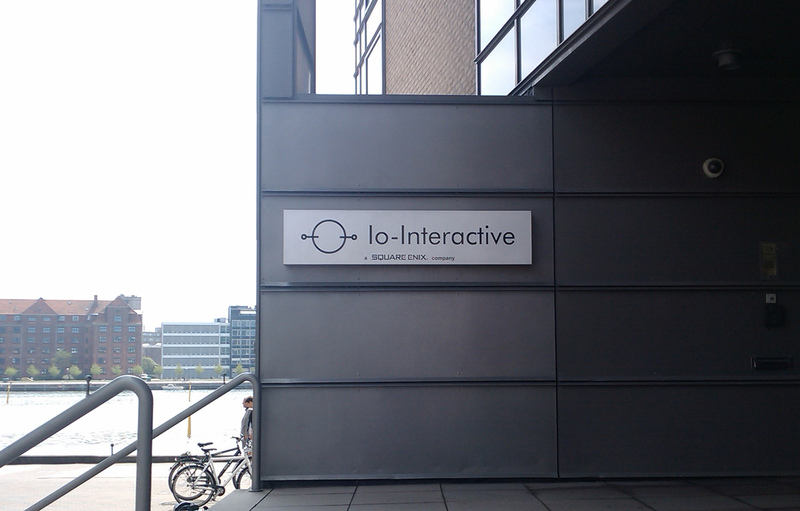 I’ve accepted an offer from IO Interactive (Hitman, Kane & Lynch) who are based in Copenhagen, Denmark. I will be moving to Denmark and starting at IOI in August! This whole thing still feels a bit like a dream. I cant believe that I’ve finally managed to achieve what honestly felt like an impossible goal when I set it all those years ago. I guess it goes to show that with hard work anything is possible. As excited as I am, I cant help but feel a bit nervous. I’m a little fish getting thrown in the deep end. Then again, I dont think I’d want it any other way. I’ve been dying to improve and to learn and I’m finally going to be working with people that I can really learn a lot from and I honestly cant wait for that!!! To everyone that’s helped me along the way, you know who you are, thank you so much! I honestly dont think I’d have gotten this far without your encouragement and support. On the downside, I dont know how active this blog will be once I start working but I will do my best to try and keep the content coming. Game dev blogs have been a huge help over the years and I would love to be able to pay the favor forward! WOOT! My thesis, the bane of my existence for the last 2 years, is finally done! Its basically a review of the video game pathfinding field as well as presenting a novel grid map search technique: the spatial grid A*. The version linked below is the final draft that is being submitted to my faculty. In a recent technical interview I got asked the following question: “if an explosion occurs i.e. from a grenade, how would you determine which characters in the game are affected”. This was a question that I couldnt answer at the time which annoyed the hell out of me and it’s been sitting in the back of my head for the last few weeks. So I decided to discuss it (and my proposed solution) on my blog as an “academic” exercise. I would really appreciate any feedback or comments on this discussion. This is far from being a solved problem for me and while my solution may potentially work quite well, there may be a simpler technique available which I don’t know about.